Horror. It was an entirely new emotion for me. His plan, and my part in it. He would become one of them – one of them! the glorious one so mundane. This was the part that amazed me. and this new emotion, horror, wrapped itself around me. paled beside this unprecedented shock. And my part was to announce all this! that she was to be Messiah’s mother. the genius of His plan. I saw kings and rulers drawn to the brightness of His rising. welcomed back to the Father who longed for them. The horror vanquished by the rejoicing. I originally wrote this piece for Through the Roof, and it is reproduced here by kind permission. 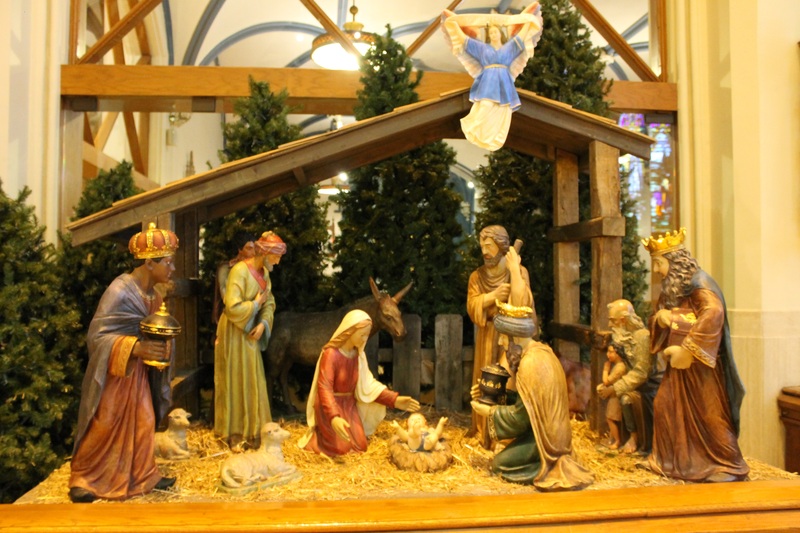 At this time of the year, we are remembering the Incarnation and all that it means to us. Surely one of its most significant aspects is that weakness and vulnerability have once and for all been emptied of shame or stigma. What God dignifies with His presence is forever sacred. Imagine the utter dependence of an embryo. It has no independent life, all its biological systems are connected to and supported by its mother’s. Imagine the impotence of a baby during the course of birth – there is absolutely nothing it can do except surrender to the process. Jesus chose to go through that. The “physically able” period of his life was sandwiched between a period of inability to walk during babyhood and an inability to walk, or even move, when He was nailed to the cross. As a baby he was fed by his mother, and on the cross he was offered vinegar on a sponge that He could no longer lift to His own lips. He knew what it was to be under the authority of His parents; He knew hunger and thirst and bone-aching weariness. He probably knew how it felt to hit His thumb with a hammer when He was learning the carpentry trade from Joseph. After His resurrection, when He appeared to His disciples, He invited Thomas to touch the wounds in His hands and feet, and to thrust his hand into the gaping hole gouged out of His side by a Roman sword. In doing so, He not only affirmed that God is permanently scarred by His experience of becoming human, but also that no physical disfigurement renders anyone untouchable, a point made by Nancy Eiesland in her book The Disabled God. The scars that Jesus still bears are signs of injury – God has shared in human suffering; and also, as Nancy Eiesland again points out, signs of healing – the place where wounds once were but have now healed. God is not only the giver of healing, but also the recipient of it. These mysteries are to some degree beyond our ability to grasp, but they also tell us that no matter what human condition we are experiencing, God has experienced it, and He understands and knows what it is like. Jesus prayed to His Father, “Glorify Me together with Yourself, with the glory which I had with You before the world was.” God answered that prayer, and yet even restored to His original glory the scars remain. I remember once when my daughter was going through some particularly harrowing suffering resulting from her cerebral palsy and one of the many operations it necessitated, I was in church one Sunday, and my heart was crying out for her. And it came to me in that moment that no human parent would voluntarily sign up to see their child go through something like that – any parent will tell you we would rather suffer ourselves than see our child suffer. And yet God understood more than anyone, for He voluntarily signed up to watch His Son suffer, and to be made impotent to help by His love for us. The only reason God didn’t swoop down and rescue Jesus from the cross is because He loves you and me as much as He loves Jesus. What a thought. In that same prayer, Jesus also prayed “that the love with which You loved Me may be in them”. The love that God feels for Jesus is the same love that He feels for us. And so as we once again set aside our normal lives for a few days to reflect on His first coming, let’s remember that He knows and understands everything we face, every weakness and pain. He despises no one – in fact the only thing He despises is shame itself: “He endured the cross, despising its shame”. That’s powerful. He reaches out and touches even those who recoil from touch out of fear that others will see their disability and stigmatise them. Those who experience weakness, vulnerability, pain, limitations or the scorn of those who despise them hold a special place in His heart. Given the choice of filling any role in the universe, theirs is the role He chose.